The Mute Swan has a deep orange bill. This feature distinguishes it from the truly wild Whooper and Bewick Swans that visit parts of the east and north of Britain in winter; their bills are yellow with distinctive black markings. Water plants and aquatic insects are the main food of these semi-domesticated swans; they have been known to denude stretches of chalk streams of their water-crowfoot (Ranunculus fluitans and related species). In many places they have become quite accustomed to accepting bread and other food scraps. 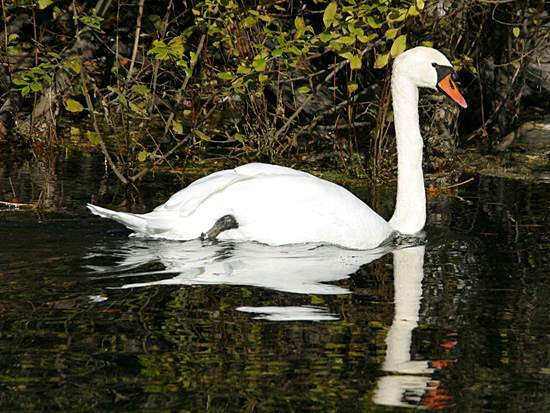 Mute Swans make nests of vegetation and down in reedy margins. 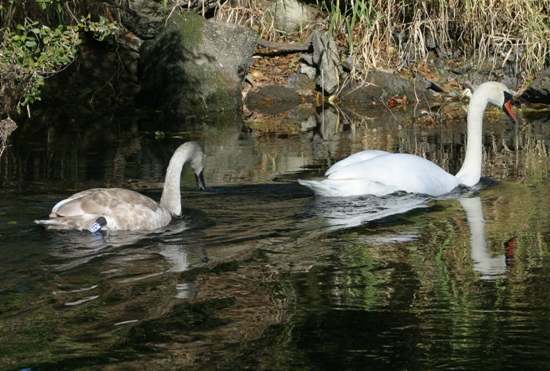 In April they produce between five and twelve cygnets; swans are very good parents. The cygnet in this picture is almost fully grown.